I have been having trouble either with the pens I am using, or with the surface of the gloves. Recently, only with the last few boxes of gloves, the glove surface is rejecting the pen. Instead of writing easily, almost as easily as on paper, the pen catches and the ink isn't a nice, smooth black. Instead it is sort of mottled and it is making the process even more tedious than it normally is. So, today my husband is buying me new pens. I hope this helps, but I have a feeling it's the gloves, not the pens. I am only about one hundred pages from the half way point of Ulysses, which seems close in a strange way...close to what, I don't know, but close. Today, on Memorial Day, I am thinking about soldiers. American soldiers mostly, but also soldiers from other countries. all those people gone, killed. I know that the media thinks we, especially liberals without children fighting, are sort of oblivious to the wars in Iraq and Afghanistan. I suppose I am in a way....I don't follow maneuvers and strategies. But I think about those who are fighting far away, all the time, and I wish they could all come home today. Alive. If nobody sees your art, is it still art? I have been dutifully writing out one page daily of Ulysses on a glove. Sometimes I write a little more than a page. I feel like I am making progress, but as I do it I always wonder who will see this when it is done, aside from my family and a few friends. Will it find its way into a gallery? A museum? How will I present it? Meanwhile I have also been working on the slinky drawings. I bought large (for me) paper last week. I had a day or two where I felt my imagination offered infinity possibilities. I felt that if I had the time to draw and draw I could create new work endlessly, great work, astounding work. It was a nice feeling. The pages have been pretty easy to copy lately, or is it, transcribe? Still, I stick to just over one page a day. I could do more, but have not. I read a nice article/essay by the publisher of Booklist magazine, Bill Ott, about his attempts to read Ulysses. He tried many years ago, decades actually, and didn't make it as far as page 100. But now, he is listening to it, and is almost halfway through. I have a feeling his book version was the same as the one I am using, because he said it had 783 pages, which is exactly the number of pages of my library copy. When I am done with this project I shall have "read" Ulysses, but not understood much of it. Most of what I learn, I learn through reading about it when others write about it. I know it takes place on June 16th. 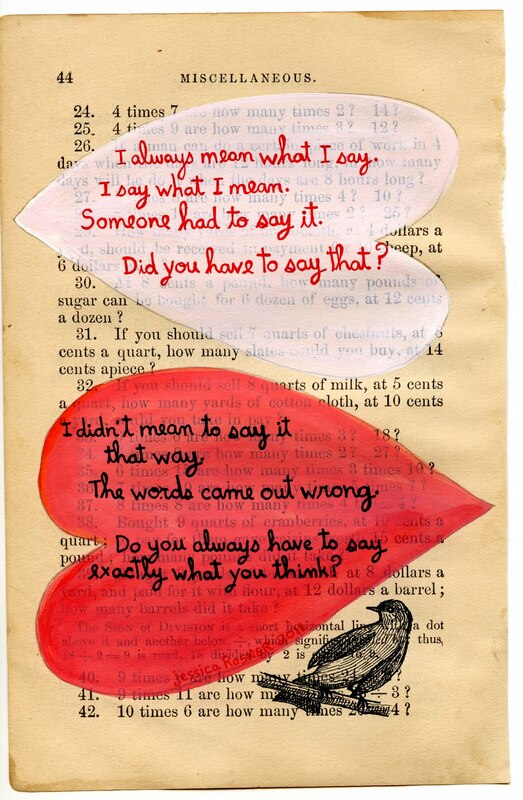 I know it is mostly the thoughts and snippets of conversation of Leopold Bloom. I think Bloom's son is dead. I think Bloom may have cheated on his wife, Molly. I think the end of the book is Molly's...eighty four pages with only four, unpunctuated sentences. Part of the reason for doing this insane project, is that it will be my version of big. So much of what I see in museums and galleries is BIG. BIG paintings, BIG sculptures, BIG installations. When I draw, I draw small, and always have. But I think that to be recognized as an artist you have to do something's BIG. I can work on one glove at a time, on my small studio desk, or on the kitchen table, but when this is finished, there is no doubt that it will be BIG. Let's hope this BIG project makes some people take notice of my smaller work. While I wrote Ulysses the movie All About Eve was on the television in my studio. There is hardly a better film to have on while working. The conversation is perfect...everything about it is perfect. I only did a little over one page because I always have to think about whether or not to work on drawings. Today I wanted to keep going with my series within a series, the paintings on math papers. 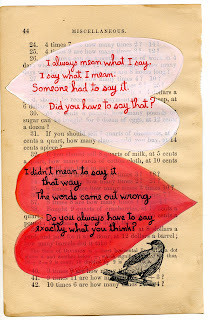 These are a few I'm doing with hearts and words, about saying the right thing and the wrong things. Also, I started a new slinky drawing and once I get going on those I become a little obsessed. I thought about people who had a moment where they went from obscure, to famous. I thought of David Sedaris and also, more recently, Julie Powell of Julie and Julia fame. What must it be like to know that you are getting the thing you wanted? The attention, the money, the chance to be a success? I admit that while there is a tiny part of me that believes it's still possible for me, for the most part I feel like it is not going to happen. But if it does, I think it will be this glove project that turns things around. If not, I suppose I won't have to buy dishwashing gloves till I die.